I know. You don’t need to tell me that these aren’t authentic because your polish nana makes these cookies and pinches them into the center over the jelly. My mom usually does that too. But know what happens when I try to fold them over and pinch the centers? After baking, I open the oven and they all look deformed and have opened up. So now I started making them this way and I couldn’t be happier. I’m sure some of you are better bakers than me, and have tricks up your sleeve for pinching these closed. Feel free to leave a comment below so others can learn! For now, I will make mine open. I use a 2 1/2 inch cookie cutter so they are rather big. But if you prefer them smaller, feel free! This goes back to my love for jelly, the bigger the cookie, the more jelly I can stack on it! I’ll also refer to these cookies as Kolachky Cookies. I know there are other names, such as Kolacky, Kolach, and Kolache cookies. I also know that some people use melted ice cream, which I’ve tried and is delicious. My only concern is that there are so many varieties of ice cream, when writing a recipe, the different fats in ice cream create different results. Line a baking sheet with parchment paper. Preheat your oven to 350 degrees F.
In a large bowl, mix the softened butter, cream cheese, and granulated sugar. Using an electric mixer, beat until creamy, about 3 minutes. Add flour and baking powder and beat until a soft dough forms. Place dough on a lightly floured surface and use a rolling pin to roll the dough to about a 1/2 cm thickness. Cut with a 2 1/2 inch circle cookie cutter (or biscuit cutter) and place on baking sheet. 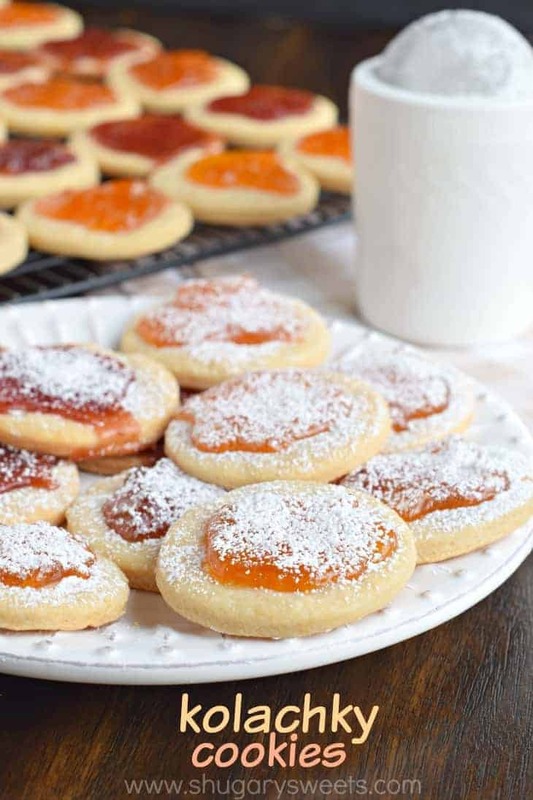 Spread about 1 Tbsp of your favorite flavor of preserves (apricot filling is my favorite) into the center of the cookie. At this point you can pinch the sides together, or leave open like I do. Bake for 15 to 17 minutes, until set. Do not let them brown. Cool completely before sprinkling generously with powdered sugar. Store in an airtight container in refrigerator for up to one week. You may need to dust with confectioners sugar again before serving. Apricot Preserves. The Apricot Kolache cookie is one of my favorite flavors! Strawberry Preserves. I make this flavor Kolach cookie for the kids, as it seems to be THEIR favorite, even though it’s not traditional. Poppyseed filling. You can buy cans of poppy seed filling (near pie filling). This is so good and Poppy Seed Kolache cookies are a family favorite! What traditional cookies do YOU make for the holidays? 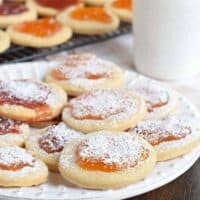 Don’t want to make cut out sugar cookies? These are the best, chewy Sugar Cookies with a no-chill dough. Topped with a creamy sugar cookie icing, you’ll love this Copycat Swig Sugar Cookie recipe! 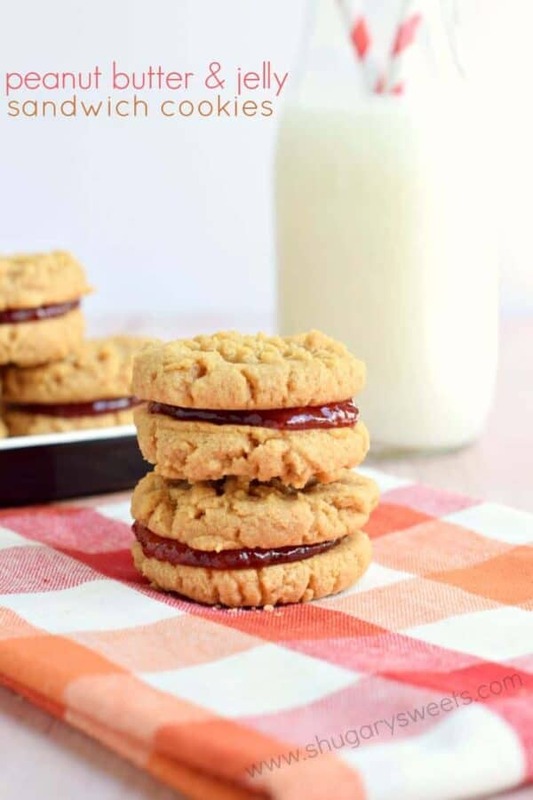 Peanut Butter and Jelly Cookies: these are amazing!!! 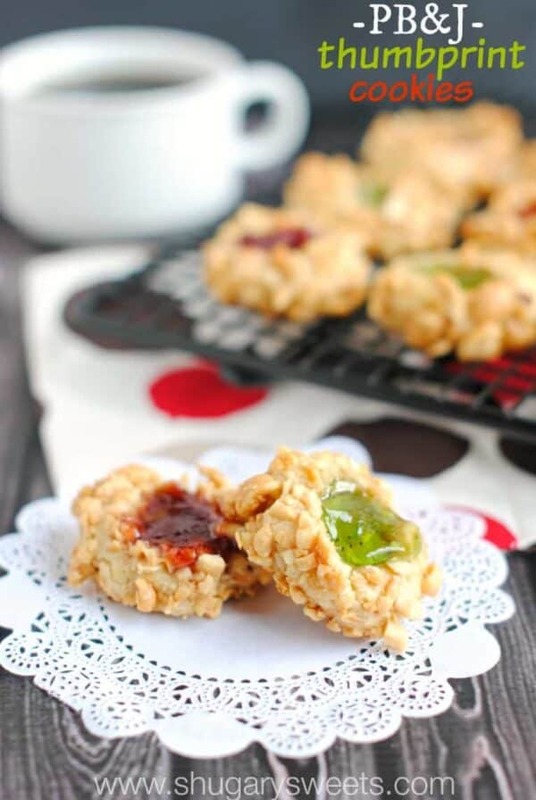 PB&J Thumbprint Cookies: my grandma’s recipe from childhood! 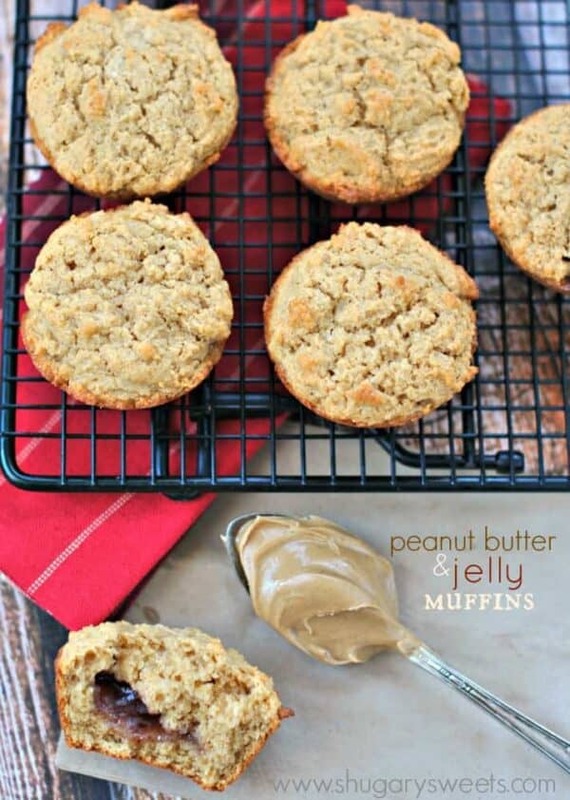 Peanut Butter and Jelly Muffins: not a cookie, but still delicious. Great breakfast on the go! 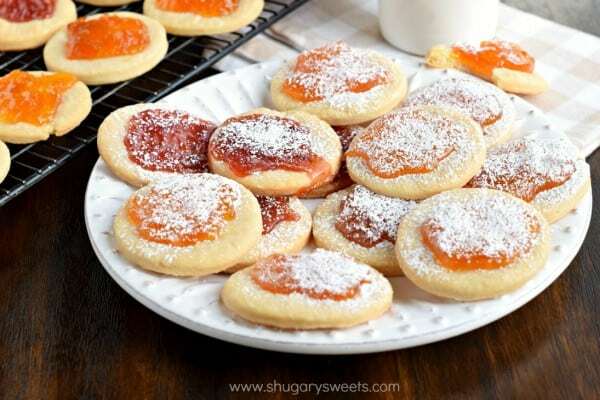 Cream Cheese based cookie topped with sweet preserves makes these Kolachky cookies irresistible! In a large mixing bowl combine butter, cream cheese, and granulated sugar. Beat until creamy, about 2-3 minutes. Add baking powder and flour. Beat until a soft dough forms. Drop dough onto a lightly floured surface and roll to about 1/2 cm thickness. Cut with a 2 1/2 inch circle cookie cutter (or biscuit cutter) and place on baking sheet. Spread about 1 Tbsp preserves into the center of cookie. Bake for 15-18 minutes, until set (before it begins to brown). Cool completely on wire rack. When cool, sprinkle generously with powdered sugar. Store in airtight container in refrigerator for one week. You may need to add powdered sugar before serving. **If desired, after adding the preserves, pinch sides up into the center of cookie. Haha. Laughed so hard when I read the bit about Polish nana. Ha. Although I lost mine many years ago, she lived well into her 90’s and would have loved these! Although she was a cheesecake woman. And grumpkies woman. But the title looked very Polish to me and I think I’ll make these in her honor, she loved cooking and I’m working on loving baking/cooking. I’m going to put them on my appetizer tray for the ugly Christmas party I’m hosting! I have this beautiful artisan board that I’m also giving away right now on my blog! yay. And I’ll put these cookies on it as I now live in her house. Thanks. Cookies that have to pinch shut are a real *itch. I have the same trouble with hamantaschen, which also are supposed to stay together but often don’t. Hey, it’s doesn’t matter, though. As long as it tastes right! These do look good! I do the fold over thing and stick a toothpick in there! 😀 It’s a great trick.Though these look just as beautiful!! I shared my little secret with my niece’s this year while we were making these. Sometimes you need just a”dab” of water to help seal them shut. Works wonders! Merry Christmas!! These look delicious! Is 1/2 cm roughly a 1/4 inch? I want to include these cookies on a treat tray gift. Also, would minced apple pie filling work? Thank you! I love these cookies SO much! I need to make a batch this week 🙂 Merry Christmas! I use a dab of the filling to “glue” the sides together when I fold them over. It’s usually sticky enough to hold during baking. 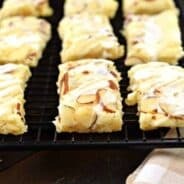 These are one of my favorite cookies to make for Christmas and I love your idea of leaving them open. I’ll make them your way jet his year and see what my family will have to say. (I’m sure it will be a discussion, lol). I have been making my husband’s Busia’s kolacki recipe for 20 yrs and always fold the corners. The truck is you need a lil bowl of water, wet your fingers, grab, each corner and then again wet finger and seal the fold. They will stay shut everytime. Got a batch of dough chilling in my fridge right now for tomorrow. Delish ???? These were amazing. They taste just like my grandmothers. This recipe is more simple to follow everyone loved it. 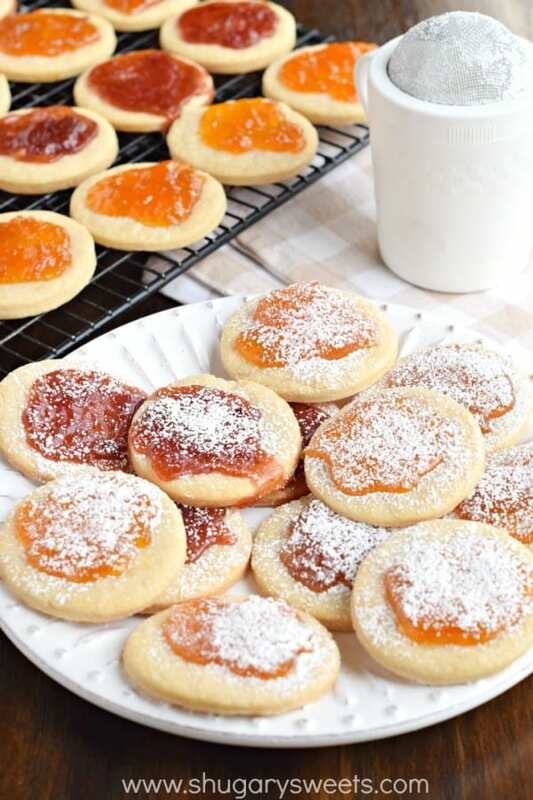 I’m all for easy baking and these are pretty with the jam exposed. Perfect addition to my cookie exchange. Love that this makes so many and we can change the jam for a variety of flavors. 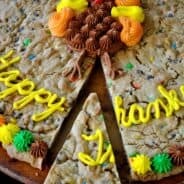 These cookies look so good, I would love to try them this holiday season! These look so awesome! Reminds me of a thumbprint but with a shortbread cookie base!! I absolutely love these with strawberry! I’m with the kids on this one!!! Haha, I love the story about the deformed cookies. So who cares if they are perfectly authentic. Yours are beautiful! These look amazing! I cant wait to try them! We have to make a batch every Christmas! Delicious! It’s a tradition at our house to try one Christmas food from another country every year. These are now at the top of my list – they look so yummy! 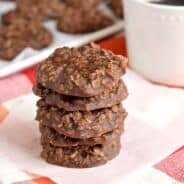 I have been baking these for years and years and use my grandmothers receipe- almost the same as yours except no granulated sugar, only powered sugar. And putting the jelly in the middle I refrigerate mine rolled up for two hours, take out cut and push my thumb in the middle of each one then add the cooking jam, and TONS (LOL) of powdered sugar!!!!! Thanks for all your recipes, I’m trying the Rice Krispie Treats tonight!